Drop-off times are usually between 8 a.m. and 12 p.m., and pick-up times are between 7 a.m. and 8 p.m.
Is the delivery and setup time part of the rental time frame? No, it does not take away from the rental time. Rentals are for a full day, usually 8 to 10 hours. 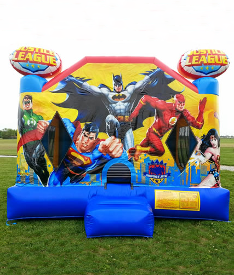 An adult must be present at the entrance of the bounce house at all times. 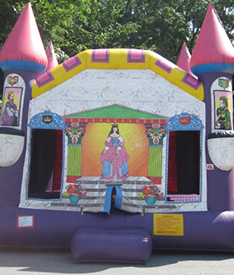 No shoes, food, candy, drinks, crayons, markers, pens, or 'Silly String' are allowed inside the bounce houses. 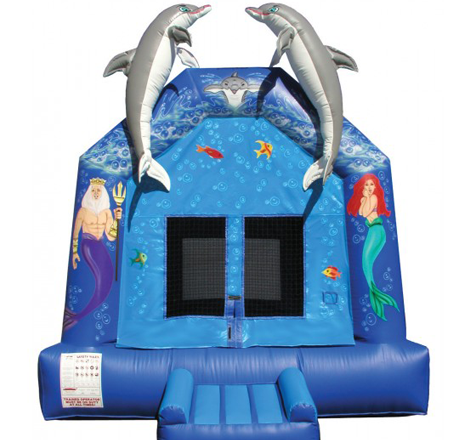 How much notice is required to rent a bounce house or slide? At least 48 hours is required for any rental; however, the further out you make your reservation the better the chance you'll get the exact house you want. What kind of surface and how much room is needed? It is best to have a level surface with grass; however, houses can be set up on concrete, pavement, sand, or mulched surfaces. The amount of room needed varies, but on average 20' by 20' space is enough.